Brite Lites TRUE Xenon HID arc/ballast conversion kits. The ultimate in lighting and being able to see. Pure white 6,000 degree Kelvin arc bulbs have no filiment to break and slim digital balasts to deliver the latest in technology at a fraction of the cost that HID kits typically cost. 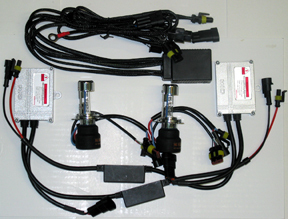 True Plug-n-Play kits can be installed in less than 30 minutes in most all vehicles. If you need the best light, these are it. Our kits are offered in 2 styles, a single beam for 9005, 9006 (GM types) and H1, H3, H7, and 880 (fog and driving lights) for $299 a kit, or our servo motor controlled 2 beam (auto focus arc Hi/Low beam) for 9003, 9004, 9007, & 9008 (H4 & H13) for $399 a kit. Check it out!! Make sure your headlight bucket has enough space for the extra wire and ballast. Sport bikes typically have plenty of space, Can-Am Spyder uses a H7 kit. Polaris RZR, Ranger, Sportsman & others use the 886 HID kit. Arctic Cat ATV & side by side all use 886 kit in rack/fender mounted lights. Driving lights use H3 most often.